Located on the Mexican island of Cozumel, Cozumel International Airport (CZM) is a relatively small facility, handling around 450,000 passengers per year. The majority of overseas visitors come for holidaymaking purposes. However, the island also attracts a significant number of visitors with business agendas. The island's well-developed tourist infrastructure provides ample accommodation options and hotels for all visitors. Amongst the most popular hotels nearby, the Presidente InterContinental Cozumel Resort and Spa is about a 15-minute drive from the airport. Business and conference facilities are available for the use of both companies or individual business guests at the InterContinental. The city centre offers a range of accommodation, being situated around 3 km / 2 miles to the south of Cozumel International Airport (CZM). All hotels rooms in the city comprise a private bathroom and a range of basic amenities, including a fan, with many establishments targeting business travellers. Hotel rates tend to be at their lowest during the mild winter months of December to February, rising sharply as summer approaches. However, much of the accommodation in Cozumel will be happy to discount room rates for walk-ins, by simply asking for a reduction, known in Mexico as a 'promoción'. Many people visiting the Cozumel area choose to stay close to the coastline, particularly on the southern side of San Miguel. Scuba divers enjoy the spectacular coral reefs and sparkling waters nearby and as a result, many hotels are located close to popular diving spots, fully taking advantage of these impressive locations. 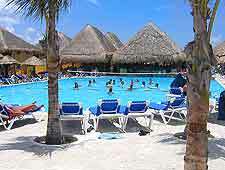 Specific diving packages are often available at hotels in these locations. Further accommodation in the Cozumel area can be found around the Parque Chankanaab Bay, next to the Parque Punta Sur - the island's most southerly tip. Also worth considering, the sandy Playa Palancar beach lies to the south of the central Cozumel and boasts a beach club actively promoting a range of water sports, including snorkelling, scuba diving and sailing.